While the article succeeded in giving me a new appreciation of COMISAF's sense of humour, I think the slide in question is a poor example of the real problem here. The objection to PowerPoint is that it's a poor method for presenting complex, content-rich information, often leading you to stuff too much stuff into one slide or image. Now, as a slide this would seem a perfect example of that. This graphic might work as a wallchart, though: I can't speak to the content in context, but I've certainly seen network diagrams of insurgent networks and the like which are so information-rich they needed that kind of wallspace to be displayed effectively, and yet were still useful. If you're attacking that network, and everyone agrees the graphic encapsulates the problem, and have that kind of schematic taking up a wall as a standing briefing and reference aid, that can be a good planning tool. As a slide it's still silly, of course, but that's separate from saying the graphic is silly. The second more common version of this problem with PowerPoint is the reduction of any complex thought down to bullets and pictures, oversimplifying it and inhibiting comprehension. This example aside, it's often better to show the graph of the results than the bulletpoint summary of the results. Similarly, it's often better to write out your plan as a paper rather than just a slide deck. That said, if you go straight to the slide deck without having done the analytical work up front, yes, odds are whatever you present will be junk: good presentation skills can prevent you degrading whatever clarity of thought you possess, but they can't augment it. I think T.X. Hammes' summary is dead-on: "PowerPoint [used alone] can be highly effective if used purely to convey information — as in a classroom or general background brief. It is particularly good if strong pictures or charts accompany the discussion of the material. But it is poorly suited to be an effective decision aid." *Both men had reputations as symbolic thinkers, and I'm sure their insights were equally deep (although that's a total assumption in the former's case as I to this day have no idea what he was on about). The difference was that the first officer let his insight be limited by the technology he was using, while the latter took a chance on a less familiar but more effective approach. I've often thought about how the first officer could have increased comprehension of that failed brief. I think the best answer to finding oneself reliant on a single incomprehensible diagram in this case would have been for him to take advantage of the fact that all the intended audience was in the room, and rather than present that monstrously baffling slide and then try to explain his way through it, instead use a big whiteboard and markers to build the argument from first principles in a more iterative fashion while he talked. The final diagram would have possibly been even more complex, but it would have brought the listeners closer to the actual thought process behind it. Caught Toronto's own Juno-nominated Sultans of String at the Rex on Friday night... shown here with friends playing Yalla Yalla! Two great, great sets. I would have thought the semi-regular addition of veteran guitarist Eddie Paton to the regulars (Chris McKhool on violin and Kevin Laliberte on guitar, along with a rotating cast of others) would have taken away from Laliberte's lead flamencoist role, but the second instrument actually enriches and balances the sound nicely; it helps they interact together and with the rest of the group so superbly well (Paton's winning grin providing a nice visual contrast with Laliberte's guitar-pick-in-the-mouth studied air of disregard, too)... well, it's really worth your time if they're in your neighborhood and you're looking for something different on the instrumental world-music side. (Their take on The Who's "Pinball Wizard" is pretty amusing, too.) They're playing at the Rex again this Friday before touring the north of the province, and coming back in Toronto for the Beaches Jazz Festival in July. But it is not unusual to see Afghan troops who seem, on patrol and in firefights, to have a very limited sense of basic fighting skills. One senior American trainer, with several years of experience with Afghan recruits and their training program, sent several e-mail messages last year discussing institutional shortfalls in preparing Afghan soldiers for war... The officer said that the way training has been conducted almost guarantees poor marksmanship skills. "Soldiers are not required to qualify on their assigned weapon (M-16) prior to graduation. A fitness test is not required either. The list goes on and on. Soldiers “graduate” from basic and advanced training simply because they did not go AWOL. If they are present on graduation day then off they go to their units." I really think you need to look at marksmanship and discipline as symptoms of the larger issue here. No one failing recruit training, and the fact I never, ever heard of an Afghan soldier in our brigade being disciplined for anything (although I recall two cases of innocent men being framed for the errors of officers), no matter how serious, both tie back to the perception that this army as a whole needed to grow at a rapid rate. Soldiers who think they are likely to face harsh discipline will desert and never come back. Afghan officers who fail to pass unqualified candidates will face more consequences than those that let them all through. It is extremely difficult to rapidly increase quality and quantity at the same time. But that it is what we've been trying to do with the ANA. People will point to the Canadian army in 1939 or the Indian army in the Raj, and say we're just using the wrong methods, but the simple fact is in those armies the people trying to rapidly improve them had a great deal more control over promotions, dismissals, or discipline in the ranks of the trained than ISAF has had over the ANA (which isn't saying much, as ISAF mentors have have generally ad little significant influence at all over any of those things). That meant there really were no consequences for failure in their system that would outweigh the risks that came with the level of commitment to the fight that Western soldiers expect. The result, unfortunately, has been that the drive to produce quality and quantity simultaneously has largely failed to produce either, at a huge cost to the war effort. As something of an aside, I think a lot of the "arm the tribes" stuff at its heart is really people detecting a problem with the military advisory approach in Afghanistan, and searching for ways to find some Afghans to fight alongside who are more in touch with their own "way of war" than the current ANA are. They evidently feel, not without reason, that we seem to have been very effectively creating a force that has the weaknesses of both our and their ways of fighting, and none of the strengths. Oh, come on, Canada, after this is there really any choice? Spock says no. I have been in the Army 18 years, third deployment.....I have seen what works and what does not. I know "population centric" operations is the way to succeed, the only way to win. The quote about not being trained in COIN was grossly used out of context and the intent of that quote was, "we cannot use not being trained in COIN as an excuse, no-one wants to hear, we were not trained in COIN!" Anti-COIN advocate Gian Gentile chimes in in support, as well. Feb, 2009: Ben Rowswell, charge d'affaires in the Canadian embassy in Kabul, mistakenly signs a letter coauthored with 2 other ISAF nations stating that the NDS will be notified in advance of any prison visits. “That reflected a misstep in the embassy. That letter had no status,” Mr. Hoffman told MPs. Upon realizing what had happened, Canada quickly rescinded this offer and informed the National Directorate of Security that no forewarning would be given. “The provisions of the letter in fact had neither standing nor effect. The chargé d’affaires did sign the letter but the contents of the letter were not implemented,” Foreign Affairs spokesman Jamie Christoff said in a statement. Sounds like a pretty big screwup (although neither the British nor Dutch seem to have rescinded it), right? Sept, 2009: Rowswell appointed Representative of Canada in Kandahar ("the RoCK"): Reporting to Canada's ambassador to Afghanistan, the representative in Kandahar serves as the principal negotiator with officials, international institutions, NGOs and military partners in the province. The representative provides strategic guidance to Canada's team of diplomats and development officers, as well as to police and corrections officials working in partnership with the Canadian Forces. Given that the NDS is one of those "partners" he's been Canada's principal negotiator with for the last eight months, it does seem a rather odd outcome for "an employee who signed a letter prematurely." I've been in workplaces that wouldn't have been quite so forgiving of such a horrible blunder. It's really sad we don't have any Canadian journalists at Kandahar Air Field who could drop by his office and congratulate him on his good luck in this regard. While Canada has given Deh-e-Bagh a host of infrastructure improvements, including a paved main strip lined with solar-powered street lights, Canadian military and civilian officials have backed away from the "model village" concept. "It's evolved to focus on the district," [senior diplomat Ben] Rowswell said. "We've realized it's not so much about Deh-e-Bagh, it's about Dand." Intensive focus on Deh-e-Bagh created resentment in other villages, [Maj] Popov said. "If there's the perception that we're only paying attention to one village at the expense of others, then we've created a grievance that the insurgents can exploit." A U.S. expert on Afghanistan who has advised the last two Canadian military commands in Kandahar said he is disappointed that the model village concept wasn't extended to other relatively stable districts in the country's south. Tom Johnson, a senior researcher at the U.S. Naval Postgraduate School in Monterey, Calif., said abandonment of the concept probably resulted from changing command priorities. "One of the problems in Afghanistan is we haven't had a consistent strategy. We've had eight one-year strategies," Johnson said. Key or model villages, tried and now apparently insufficiently successful to be perpetuated, was the key new idea of Canadian BGen Jon Vance when he took over as Task Force Kandahar commander in early 2009. The Gazette story may also give context to his successor BGen Menard's somewhat off-the-wall comment to Paul Wells this week: "They [the Afghans]'re not after, you know, solar-powered lights or whatever. They want water." "They detached us [1/12 Infantry] from our brigade, which is headquartered in eastern Afghanistan, and sent us out here to Zhari district to be storm troopers — that's what General Vance called us — and that's what we were trained for, that's what we like to do. To find, fix and finish the enemy." But the mission changed with the arrival of General Stanley McChrystal, as commander of the International Security Assistance Force in the summer of 2009. "It's not about how you engage the enemy so much now. It's how you engage your district governor," says Brown. "That's a huge change for guys like us — call us knuckle draggers or whatever, but we weren't trained to do COIN." My long-ago media colleague Doug Saunders has done us a public service by posting some of the evidence from the British detainee hearings. They're definitely worth your time. If you only have time for one, read #5, the 2006 British estimate of the options available. The pull quote from this one relates to Canadian cooperation but what's striking in reading it is the British conclusion that given the limitations of the Security Council resolutions, etc., there really was no choice open to them other than trusting the Afghan authorities with primary responsibility for Afghan detainees. The remorseless "no good options" logic of it is striking. Doug's article on the same topic, however, baffled me in its last sentence: Documents released in the Canadian detainee case have shown that Canada repeatedly avoided building a detention facility, despite requests from several countries and branches of the Afghan government. I have seen nothing in any record that indicates Afghans ever having interest in having anyone but Afghans take on the Afghan prisoner responsibility. Other than strongly encouraging us to build them new facilities, give them new computers (in the original boxes if possible) etc., sure... but I don't believe the sentence's implication that Afghans would have readily consented to a Canadian-run long-term detention facility in Kandahar is remotely supportable. Ahmed Wali Karzai’s influence over Kandahar is the central obstacle to any of ISAF’s governance objectives, and a consistent policy for dealing with him must be a central element of any new strategy. Wali Karzai’s behavior and waning popularity among local populations promote instability and provide space for the Taliban to exist. "In contrast to the police force, the Karzai family has installed close allies into the NDS in southern Afghanistan, and the Kandahar NDS is a vibrant and strong organization loyal to Karzai family interests... The NDS in Kabul is directed by Amrullah Saleh, a Tajik and former deputy to Massoud. But Saleh has limited influence over his organization and is kept in power mostly because of American backing. His influence over the organization does not extend to Kandahar. Several close Karzai allies and even family members in NDS Headquarters in Kabul ensure Karzai influence in parts of the NDS bureaucracy. This shadow ownership enables regional branches of the NDS in areas like Kandahar to be dominated by strong Karzai allies... There are few additional details in the open source on the leadership of the Kandahar NDS or on its leaders’ political affiliations, but there is common recognition that the Kandahar NDS is strongly loyal to the Karzai family." Also on your must-see list should be Frontline's documentary this week on bacha bazi, the latest piece by suicidally brave Afghan journalist Najibullah Quraishi (who also did that "Behind Taliban Lines" piece a couple months back). I for one wholly endorse my colleague Pat's suggestion for our next Governor-General, if only because it gives me another opportunity to link to this. Britain agreed to a Memorandum of Understanding (MoU) in 2006 with the Afghan government upholding the "basic principles of international human rights law such as … the prohibition on torture and cruel, inhumane and degrading treatment". However, the court was told that British officials had admitted that the "whole legal basis" of the MoU was based on trust. ... The MoU was described as "aspirational in nature". The NDS had consistently denied that it was bound by the MoU and had shown disregard, even contempt, for its terms, the court was told. The fact that there were no sanctions, political or legal, when the MoU was breached, was described as a "serious flaw". Ah, now that sounds like the NDS guys I knew. The Star's Tom Walkom, meanwhile, seems to have missed the CDS' memo. Came too late for deadline, I guess. Because we can all agree that writing a column about something that the head of the nation's armed forces has categorically denied the day before without mentioning that denial at all would surely be too irresponsible for any serious journalist to even consider. Walkom goes at it again today, stating the CDS did not deny the "transfer to interrogation" allegation in his letter. Even though he did. But I'm sure it's an honest oversight. Probably ran out of room, or an editor accidentally deleted a sentence, or something. Because you'd have to be a severely impaired box turtle with a very busy schedule to fail reading comprehension that badly, and we all know Walkom isn't one of those. Paul Dewar, MP, is asking the Canadian Chief of Defence Staff to reconcile his statement that detainees were never transferred for the purpose of gathering information with the statements before a Commons Committee by an ex-translator. It should be noted that Mr. Dewar probably had an opportunity to answer that question already. Mr. Paul Dewar: You say that in this arrangement where these, in this case there were six and I’m looking at the date is October 2007, there were six of these people who were interrogated by Canadian Forces and then passed on to NDS. You’re saying that when it says at the end that the interview’s concluded, believe that the detainees were deceptive and have better knowledge than they suggested they did, that the idea here was to pass them on to the NDS to extract more information, because of the methods that NDS used? Mr. Malgarai Ahmadshah: The language is very simple here if you look at it. If they wanted to extract more information from them if they were deceptive, keep them for longer and ask them questions until you’re satisfied. If you can’t get it out of them through a normal way, then you have to subcontract the torture. It’s not the first time it happens. We did it with Maher Arar. We subcontracted his torture*. So why would anybody doubt that we did not do it with Afghans? Mr. Paul Dewar: It was understood then when the detainees were being transferred to NDS, it was done for that purpose? Mr. Malgarai Ahmadshah: There was no one in the Canadian military with a uniform who was involved in any way, at any level, with the detainee transfers that they did not know what was going on and what NDS does to their detainees. The second answer is, of course, non-responsive**. Mr. Dewar's obvious followup there was: "You've said you translated documents to be given to the NDS. Well, presumably their documents had to be translated, too, right? So, working as the Canadian translator, were you ever asked to translate an Afghan interrogation report for Canadians to read? No? Then how would this "subcontracting" of interrogation you suggest have worked, exactly, if the NDS never told us anything?" *I do not believe this is an accurate statement of the Commission of Inquiry's findings in that matter, and speaks to the witness' bias. **And a little insulting. There is still a distinction, one hopes, between "could have reasonably assumed" and "knew." It's nice of Prof. Stephen Saideman to try and resurrect some form of a post-2011 Afghan mission in the opinion pages of the Globe, but surely he's got to see that the ideas he proposes -- perpetuating the PRT and the OMLT presence -- are probably non-starters in the current detainee-allegations-laden realm of public opinion. There are only two real jailors in Afghanistan. The NDS and American forces. Rightly or wrongly, it's hard to see public support swelling any time soon for any new Canadian mission that turned any detainees our forces were involved in taking over to either of them, unless certain outstanding issues could be said to have been resolved first. Both the OMLT and the PRT (in its police mentorship and other judicial reform aspects) have to work closely with Afghan security forces, including the NDS, and, if current headlines are any indication, their members would necessarily be accused of complicity, sooner or later, in any eventual reports of their excesses if either of those components were to be extended now. The same concern of course would extend to any involvement in the UN's troubled Congo mission helping the Kabila government suppress its insurgency there, should it involve more than a handful of Canadian troops. Not only are Congo's troops certain to be even more, erm, unruly than their Afghan counterparts, but Kabila has been even more strenuous than Karzai in saying all UN troops must leave by 2011, thanks very much, don't let the door hit you on the way out. The simple and perhaps only way to avoid it all, of course, is to withstand those concerns, often from some of the same human rights advocates, for the West to "do something" when these sorts of what are essentially civil wars occur, and avoid offering military support to the governments of failing states at all. Which, it should be noted, until about 1960, around the time of the first failed UN Congo mission, was very much the default Western middle-power position (see also, "Spanish Civil War, non-interference in"). The roads not taken in Afghanistan for the ISAF coalition on the detainee issue were simple and clear-cut, too. ISAF could have turned detainees over to the U.S. system; although you may recall some people having issues with that some time ago. Or it could have demanded early on that the Afghan government accept that insurgent suspects could not be handled properly by its so-called criminal justice system and embark with the Afghan army in building some sort of joint detainee detention facility where Geneva rules could apply. This would have essentially meant forcing the Afghan president and his government to do something they strenuously didn't want to do (admit they were fighting a civil war, basically), and trodding all over their sovereignty that way really hasn't been the West's style all along here. (If a country doesn't have sovereignty over its own courts and prisons, it doesn't have sovereignty over much.) And that has brought us to the current impasse. It's good public-interest journalism of CBC to be posting the Military Police Complaints Commission hearing transcripts. As a followup to this post, you couldn't have had a more straight, flat-out denial than this one from the CDS: "The Canadian Forces DO NOT transfer individuals for the purposes of gathering information." Note that all the objections of Canadian Forces critics given here now mostly relate to a lack of clarity about the shooting incident itself, but not about the reason why the 10 Afghans detained after it occurred were later transferred to the NDS... which was ostensibly the reason this witness was brought before the Commons committee in the first place, as evidence of the "outsourcing of torture". It's classic bait-and-switch. Having failed to get the mud to stick on the outsourcing, Prof. Attaran, et al are now questioning the split-second tactical decisions made by a Canadian soldier facing an armed opponent three years ago, because really that's all the CDS's well-tuned statement has left them to work with. The one other thing that Prof. Attaran is now demanding is that the Canadian Forces make available an officer who authored a report that his witness claims to have seen claiming some kind of evidence-planting during the event in question. The one thing I'd note there is that, by standard NATO practice, all intelligence reports bear the originator's name. If Prof. Attaran's witness was working closely with Canadian intelligence officials at the time, as is believed, he likely would have recognized the name, or at least been able to provide the name of the writer's boss, or his boss' boss: does he simply not recall? If not, why would his recall of the substance (or even existence) of this report be considered reliable when he is unable to recall anything at all about its signature block? Again, these are the sorts of questions a proper lawyerly cross-examination or police investigation would probably have better luck with than a Commons subcommittee. Interesting piece on Canadian military detainee practice. I can't corroborate the numbers given: over 4 detainees on average a week through the Canadian cage would have seemed very high to me, but I was only there for some of the report period, too. The actual AIHRC report isn't any more illuminating, and has some issues of its own that should probably have raised some journalistic eyebrows. Note the lack of any presumption of innocence in the actual AIHRC report's phrasing: "the AIHRC received notifications about the handover of 267 insurgents" (no "alleged," or even "assumed", although the Canadian Press article helpfully adds that caveat for them) and the odd passive voice it's in, suggesting these might not all have been official notifications by the governments involved. There's no further breakdown or detail, for instance by month or location: just that one single sentence that CP otherwise repeats verbatim. This year is also the first year the AIHRC has given this kind of a national breakdown; in the first part of 2008 it just said there had been 330, country unspecified. The CP crack about "The Canadian numbers, however, are available for the asking in this country [Afghanistan]," seems a little snide... as best as I can determine that AIHRC report was published on an internationally available website in February. The fact the reporter's in KAF made no difference in obtaining that particular info. I'm not necessarily saying there's anything henky with the number of detainees given, just that a little vestigial skepticism might still be warranted, too. We've learned from hard experience that an Afghan opinion poll is not to be taken as equivalent to one conducted under Canadian circumstances. The same gap might be safely assumed to exist between Afghan NGO reports and their Canadian equivalents. Interestingly the rate of reported human rights violations recorded at the AIHRC Kandahar regional office is significantly lower than elsewhere (p. 17). The AIHRC has been doing absolutely vital work, no question, particularly in expediting the release of Afghans held past their prison terms due to the medieval nature of the country's justice system. But any time you have translation issues, compounded by a country that uses a completely different calendar (the Afghan calendar starts between March 20 and 22 of ours) you're going to get issues with longitudinal statistical reporting like this unless you're really rigorous. It may also be worth noting that really the only two organizations dedicated to holding any Afghans for questioning (the NDS and U.S. forces) both currently deny access to the AIHRC, as UNAMA reported back in March (page 8). So AIHRC really only ever sees any of these people after they've passed into and through the court/prison process and out of questioners' control. The UNAMA report, which doesn't deal in any numbers, should probably be seen as the more reliable assessment of actual progress, FWTW. Its summary: "Conflict-related detention policies in Afghanistan continue to be a major concern given the lack of a legal framework which complies with Afghanistan’s obligations under international and national law." I'm afraid so long as that's the case, that the UN official position is that Afghanistan remains essentially a lawless country, these allegations by human rights activists aren't going to be going away. Long story short (speaking now as an ex-journalist AND ex-PR guy): I'll be a little surprised if the Canadian government publicly accepts or corroborates the AIHRC detainee figures come Monday, although they will also be determined not to disparage the fine Afghan organization the figures came from, either. That's a fine tightrope to walk, though: the chances for someone tripping up and saying something untoward when asked about it could be rather high. Canadian soldiers have spent a lot of time in and around the town of Senjaray. Anyway, anyone who spent time in Zhari district might be interested in this story about what has changed there, and what hasn't. See also Paul Wells in Maclean's. Michael Yon, whose inflammatory calls for generals to be fired have been written about here before, has been "disembedded." This came the same day he wrote, "Is there an Afghan Patriot? A Leader who cares more about Afghanistan than himself? Karzai's Afghanistan is not worthy of western support. If Afghanistan wants our support, they need to get rid of this guy. Karzai is an obstacle to progress." Yon apparently can't see why enabling that sort of unique perspective of his would be a problem for American commanders right now. I am American. Today, I do not trust McChrystal anymore than some people trust the New York Times, Obama or Bush. If McChrystal could be trusted, I would go back to my better life. McChrystal is a great killer but this war is above his head. He must be watched. I mean really, I know it's a Facebook wall, but the guy reads like Rorschach's Journal now. No point in ignoring it. The current story does highlight the importance to our operations of those few Afghan-Canadians who work as LCAs (language and cultural advisors). Because you had to be a Canadian citizen to get a security clearance, and you had to have a security clearance to be allowed into Canadian military facilities overseas, our commanders and the like couldn't do what my group did and hire local interpreters, and often had to rely on that relatively small group of Afghan expatriates with sufficient freedom from other employment or obligations here in Canada to do a six-month stint with us. All the LCAs I worked with were nice guys, don't get me wrong. I wish we could have used them more to help with our desperate need for written translation. But among the ANA, where I worked, the local guys had their advantages, too. Afghan soldiers were often skeptical of the LCAs, who unlike local terps wore Canadian uniforms on duty at the time. Rightly or wrongly, professional soldiers in any army can sometimes tend to look down on people wearing uniforms they feel haven't been "earned." The Afghans thought they were poorer interpreters than the locals, generally speaking (although the Canadians often thought the opposite) and tended to look down on them as expatriates, who to be fair to the Afghans are frequently objects of criticism by those who have stayed behind in years of trouble, in any country. It was a bias, not entirely a rational one on their part, but it was there. Sometimes the feeling was mutual on the LCAs' part (again, rightly or wrongly). LCAs tending to be older gentlemen, coming from civilian businesses and the like, sometimes had difficulty relating to the younger, harder Afghan men, the kind who tend to hold soldier jobs in any country: they did better with elders and people of import. LCAs obviously often had a better understanding of what was said than we did, but sometimes military customs and vernacular would elude them, too. It didn't at all surprise me when I found they had misheard or misunderstood some soldier's story. But that was also true of local terps. That said, anything any LCA says about his own experience would likely be unimpeachable by me and most other Canadians on tour. If he worked as the task force commander's "terp," an LCA would have been literally by his side whenever he left KAF. LCAs, having the run of KAF, heard as much gossip as any soldier did. And he would have understood more about a passing encounter with an Afghan civilian or an NDS member than he ever could have explained to his Canadian colleagues. It would likely take some form of proceeding involving real cross-examination, not just the work of the intrepid Laurie Hawn, MP, an ex-pilot, to sift through this witness' statements to find whatever kernels of truth are there, no offence to Mr. Hawn. It's notable to me how the witness' prepared statement ("The military used the NDS as subcontractors for abuse and torture") and his extemporaneous remarks ("I don’t call nobody a liar") differ in tone, indicating some extensive preparation, possibly with his interlocutor, Prof. Attaran, who himself has a long history of making allegations later found to be unsupported about the Canadian Forces. MP Paul Dewar's latest leak (and there will undoubtedly be others like it; we're now at the stage where people can tend to start looking around for buses to throw others under) also sounds problematic at first glance: "It is [believed] that all the detainees were deceptive and they have a better knowledge on TB [Taliban] activity in their area. Based on the above, it is recommended that [the prisoners] be transferred to the NDS for further questioning" does sound like the outsourcing of interrogation. Not knowing the specifics other than what's in the press, it is probably worth noting once again, though, that Canadian black-letter policy only allowed for one of two outcomes of any Canadian detention: NDS-transfer and release. I suspect the quoted statement could be read in that context, as an argument by field soldiers for a continuing detention of some suspicious characters by *somebody* -- advising against releasing the individuals outright in other words, rather than a plan to garner further intelligence. I would advise remaining highly skeptical that the NDS were requested by or provided Canadians with any substantive reports derived from questioning these or any other individuals, either those few Canadian detainees (on which I had no visibility at all), but also the much larger number of "Afghan" detainees -- meaning those taken with ANA or ANP present at the point of capture (by late 2008, that was pretty much all of them) -- that I would have been involved with. I certainly never saw any such reports. Ever. The NDS officers I encountered during my tour were astonishingly and famously reticent, and entirely uninterested in our queries or counsel regarding "their" detainees, and they didn't often share anything they knew of value with their own army, let alone ISAF forces. As far as we and the other Afghan security forces were concerned, the transfer of a detainee from the ANA or ANP to the NDS ended all possibility of further information from them, or influence on their disposition (positive or negative) for that matter. It certainly didn't stimulate it. And to be fair neither the Afghan soldiers nor we ourselves tended to push that issue, as I often complained about at the time. But "outsourcing" or "subcontracting" anything to those men with the expectation of getting any kind of a straight answer back would simply have seemed ludicrous to us at the time. There were brick walls out there that offered more in the way of info than some NDS officers. Good for Robert Reeve and Purmist. I wish him luck. Gillani, asked for comment last night, did not respond. His recently hired spokesman, Brian Kilgore, whose website bills him both as a public relations expert and dog photographer, called and said Gillani would not be responding to the Star's questions. It's possible some people might be confused about the stories saying the Afghan NDS were reported to be cruel jailors, but also tended to take bribes to release insurgents a lot. In our kind of Western justice system that would seem... contradictory. But not in Afghanistan. One cannot rule out the likelihood here that this is just evidence the system is, in fact, functioning as designed: that is, functioning primarily as a mechanism for generating bribes for local officials through catch-and-release detention policies. The threat of ill treatment itself is itself a primary tool to efficiently extract the levy from the friends and family of the detained. If NDS custody were not seen as hard time, and the NDS themselves as hard men, there would not be the same sense or urgency to spring someone. The prompt releases and the reputation for abuse, deserved or not, go hand in glove in this way. This idea we have, of Afghans permanently and humanely detaining other Afghans, whether as convicted criminals or prisoners or war, in a bid to end this insurgency was of extremely limited application in Kandahar a year ago. It was, simply, a fiction. To pick a hopefully familiar point of reference, the reality could even have been said to have borne some resemblances with the justice of Capt. Renault in the movie Casablanca, with its bribes and "usual suspects": and really, should we be so surprised that that would be the case? If a land where such practices were common was not so foreign as to be incredible to 1940s Western movie audiences, it should not be so surprising to us in dealing with a real-life country that in many ways missed out on the 20th century altogether. Take, for example, the case of Taliban commander Haji Malik, who regularly visited Police General Ghulam Patang in Mazar-e-Sharif. Malik was on the military list of most-wanted insurgents, and he was believed to be behind many bombing attacks. But Patang refused to arrest the man, despite intervention by the German military. He was highly regarded in the region, the police chief explained, and besides, there was no official arrest warrant. When the pressure became too great, a typically Afghan solution was agreed to. Malik went to prison voluntarily, as part of a deal under which the military officials had three days to come up with evidence against him. But no evidence was found. On the fourth day, Malik left the prison as a free man. The Taliban militant warmly embraced his former captors and vowed not to set off any more bombs. But in any case, it's all rather moot. The Der Spiegel article also makes the implicit argument that I have made in this space before: when you are unable to keep the police reliably alive until the next morning, keeping them honest as well is really not one of your first-tier problems. Before anyone gets too excited over the Wikileaked gun camera footage from a 2007 Baghdad engagement, it might be worth their time to read the fairly thorough official report of the U.S. army investigation of the incident, in which two Reuters staffers died. The picture above, reproduced from the report, was taken by the one of the Reuters cameramen from a crouched position behind a building seconds before the Apache helicopters attacked the group of armed men he was amongst, one of whom was clearly carrying an RPG (you really don't need to be an imagery analyst to see it, but the report provides closeups in case you missed it, too). 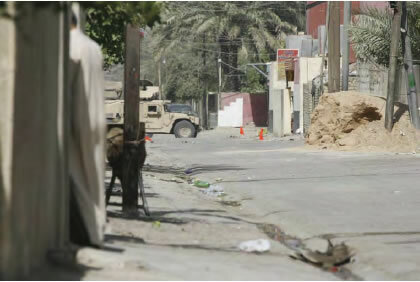 Note how it shows a US HMMWV less than 100 metres away down the street, well within that RPG's range. The report also confirms that U.S. ground forces in the neighborhood remained under fire throughout the day, and that multiple weapons, including that RPG, were later found among the bodies. One could certainly debate whether the subsequent engagement of a van attempting to evacuate the wounded was *as* justified, but there should be no question about that initial engagement: at a time when US ground forces down the block were being sporadically fired upon, a group of over half a dozen armed males within effective weapons distance of those friendly troops behind the next building over would have almost certainly been a legitimate target for their helicopter support to engage. The presence of the journalists in amongst them was unexpected, tragic, coincidental, and irrelevant to that determination. PS: There's a lot of misinformation here. Anne Flaherty's report linked on the Globe is wrong when it says, "A military investigation later concluded that what was thought to be an RPG was really a long-range photography lens; likewise, the camera looked like an AK-47." That is completely incorrect. The report clearly states that there was an RPG (in addition to the two cameras), and you can clearly see one on the video (in this version, at 3:44, look at the two guys across the street, one with a broad horizontally striped shirt, who's carrying an AK, and the guy next to him with the RPG), AND that one was found on the scene under a body. All the report actually states is that at one point, "the voice on the guntape mistakenly identifies the long telephoto lens as an RPG" (this is the point when the photographer pops his head around the corner to take that picture above), not that a real RPG wasn't there, too, being held by the guy standing literally right next to him. The Wikileaks report that the stories are based on is also wrong, when it states the two injured civilian children were sent to an Iraqi hospital: the official report clearly states they went to an American military facility. PPS: This is the same incident discussed in pp. 96-105 of David Finkel's The Good Soldiers, btw. Finkel was embedded on the other side, with the battalion commander of the U.S. troops in contact. See also Roggio, The Captain, Schmedlap, and Ink Spots. Public funding provided by Veterans Affairs through the Children of Deceased Veterans Education Assistance Act, set up in the wake of the Korean War, was and is okay: no complaint here. Any additional top-up funding that public universities choose to provide from their own funds for the same people in the wake of the Afghan War is not, because that would glorify an "illegal and immoral war." The diplomat decried “endemic and systemic duplicity within the NDS, especially at the provincial level, that exists to this day, and renders it virtually impossible to have an open and transparent relationship with their officials on the ground in Kandahar.'" Always interesting to see the grass from the other side of the fence isn't it? Mr. Anderson's assessment of the NDS itself would not be too far from my analysis of the NDS officials I've met, but his assessment of our military relationship with the NDS is wildly at variance with the reality I observed, or any of my own encounters with NDS officials. Specifically, "intimate," "comprehensive," "daily," or "all aspects" are not words I would have ever thought of using in that context. With all due respect, I think he's mistaking Afghan officials' generally greater respect for and conviviality with soldiers and uniformed men over western civilians as an indication of greater inter-organizational trust, which again would not have been my actual experience. UPDATE: "An indispensable source of intelligence?" Um, yeah, no.